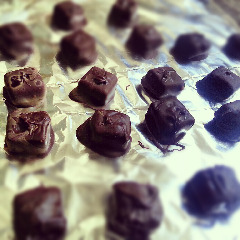 "Chocolate covered caramels sound like a great treat to make at home. Are they hard to do? I'm not very domestic but they sound like fun." I started to type out the recipe in my reply to her comment & then realized that it might make a good post unto itself. I'm not very domestic, either, Azara (just ask my husband) but I do like making sweet stuff. This little project was easier than I thought it would be--from unwrapping the chocolates (I admit I had an assistant with that) to dipping part, I think it took less than 15 minutes. Melt some chocolate chips in the microwave by heating them for 20 seconds at a time & stirring in between each time until melted. If you just put them in for a few minutes straight, you may burn the chocolate in the middle. Put the caramels on some foil, parchment, waxed paper or a non-stick pan. Distract yourself until they're cooled & ready to eat. I didn't bother with tempering the chocolate. I hear that it's some mysterious process involving double-boilers, marble & careful temperature calculations. Meh. Some of my chocolates have a whitish cast to them (wax bloom or something?) but most didn't & all of them taste great! I may never have reason to buy boxed chocolates ever again. I may also need to add another fitness class to the week to make up for this dangerous new hobby.